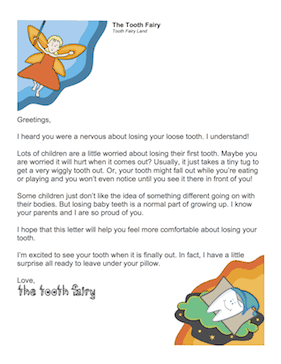 Sometimes losing teeth can be scary, but this reassuring letter from the Tooth Fairy might make everything a little easier for your child. I heard you were a nervous about losing your loose tooth. I understand! Lots of children are a little worried about losing their first tooth. Maybe you are worried it will hurt when it comes out? Usually, it just takes a tiny tug to get a very wiggly tooth out. Or, your tooth might fall out while you're eating or playing and you won't even notice until you see it there in front of you! Some children just don't like the idea of something different going on with their bodies. But losing baby teeth is a normal part of growing up. I know your parents and I are so proud of you. I hope that this letter will help you feel more comfortable about losing your tooth. I'm excited to see your tooth when it is finally out. In fact, I have a little surprise all ready to leave under your pillow. This letter is available in two versions: a free, ready-to-use PDF version and a $5 editable DOC version. If you don't see a fairy printable or category that you want, please take a moment to let us know what you are looking for.